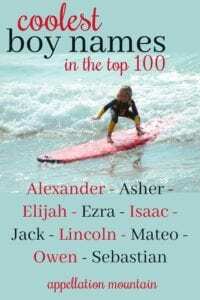 What are the coolest Top 100 boy names? Yes, I said that right. Too often we dismiss the Top 100 names, assume they’re all overused and washed up. 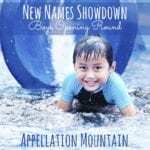 Because names only make it to the top of the popularity charts if they’re truly great names, with broad appeal and plenty of positive associations. In our age of more and more diversity, the odds that any child will share a name – even the very most popular choices – continue to drop. If finding a truly unusual name is important to you, that’s fine. But if you’re comfortable with something familiar? That works, too. 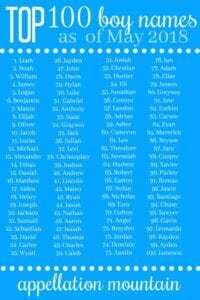 These are my picks for the ten coolest Top 100 boy names. 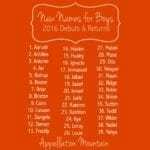 But I’ve included the entire list of Top 100 names, too – because I can’t wait to hear what you would choose as your favorites! Okay, I’m biased – this is my firstborn’s name. Except we didn’t choose it for the cool factor. It’s a family name, a choice I had to grow to love. And yet, I’ve come to hear it as effortlessly cool. It’s classic, yes. But it’s not quite in the enduring classics category, like William or James. Instead, it combines the ancient appeal of Cassius or Titus with the very modern ‘x’ factor of Hendrix and Jax. Alexander sounds quite grand, a regal name that pairs well with “the Great.” But Alex is every bit as casual and approachable as Jack or Dash. And if Alex isn’t your speed, alternative nicknames abound. Read more about Alexander here. We love all of those -r ending surnames, like Carter and Hunter. Asher fits that pattern, but it’s actually a Biblical boy. The Old Testament name means happy or blessed – a powerful, positive association. Despite all that history, it was seldom heard as a given name in the US until quite recently. Now that Ashley is a mom-name and Ashton is fading in use, too, Asher feels like the freshest, and yes, coolest of the options. Another bonus? Even though the name doesn’t come from the ash tree, the shared sound makes Asher feel like a brother or Rowan or Willow. Read more about Asher here. Not so long ago, girls’ named ended with -a. 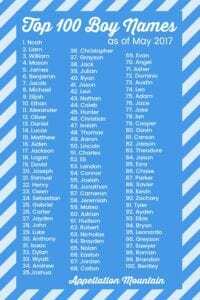 And boys’ names? They simply did not. Then came Joshua and Noah and a whole long list of -a ending names that felt perfectly masculine. There’s something cool and confident about Elijah. It’s an elaborate name, all flowing vowels. And yet, there’s a strength to it, too. Maybe that’s because the Old Testament Elijah worked all those miracles. 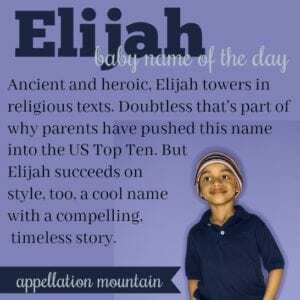 Read more about Elijah here. Ezra leans literary, thanks to Ezra Pound. But it’s also contemporary. 90s rock band Better than Ezra put it on this generation of parents’ radar, and now young actor Ezra Miller – of Fantastic Beasts and Justice League fame – is keeping it in the spotlight. With that razor-sharp ‘z’ and unconventional sound, Ezra seems quirky and cool. And even though it’s leapt into the US Top 100 for the first time ever in 2015, Ezra still feels distinctive. 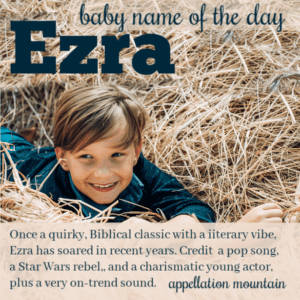 Read more about Ezra here. 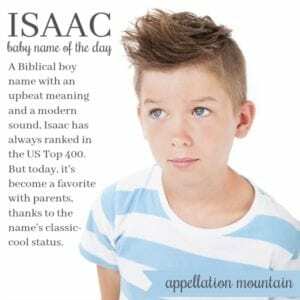 There’s a notable Isaac in nearly every field of endeavor, from scientist Isaac Newton to writer Isaac Asimov to designer Isaac Mizrahi. Rock and Roll Hall of Fame inductee and Academy Award-winning songwriter Isaac Hayes takes it from classic to cool. And the s/z sound that almost suggests the nickname Zac for Isaac helps, too. Read more about Isaac here. Nearly every fictional man of action is called Jack. There’s Jack Sparrow and Jack Bauer, Jack Reacher and Jack Ryan. It’s the single-most popular male character name in movies. That’s nothing new, though – Jack has been jumping over candlesticks and climbing beanstalks in nursery rhymes and fairy tales for centuries. It’s a strong and straightforward name, the unbuttoned, tie-loosened cousin to the classic John. JFK makes the name feel cool; so does Jack Nicholson. No matter how popular this name becomes, Jack remains handsome, capable, and yes, cool. We picture President Abraham Lincoln with a stern face and a stovepipe hat – not a whole lot of swagger. And yet, Lincoln does feel cool. Some credit goes to short form Link, which takes this name to the video game empire of Zelda. Indie darlings They Might Be Giants released Lincoln way back in 1988. It’s named for both Lincoln, Nebraska and the duo’s hometown of Lincoln, Massachusetts. We do love a place name. But maybe Lincoln’s cool factor goes back to Honest Abe and his leadership in tough times. I’ve yet to write about Lincoln. Check back and I’ll update when I do. 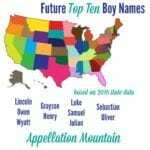 For ages, American boys were named Matthew, and even you were given one of the many international variations of the name, you probably introduced yourself as Matt. But today romance language names are on the rise, and Mateo feels like one of the coolest choices in the Top 100. It feels classic, even traditional, since we all know a Matt (or three). And yet, the bright ‘o’ ending takes in a different direction, unexpected and undeniably cool. Read more about Mateo here. Owen isn’t new. In fact, this Welsh name has appeared in the US Top 1000 every year since the rankings were established in 1880. And yet, it’s never been more popular than it is today. Why? The bold letter O appeals to modern parents. Characters from Star Wars, Party of Five, and Grey’s Anatomy helped. But actor Owen Wilson probably deserves credit for the name’s spike in use. From comedies like Zoolander to Academy Award-nominated movies like The Royal Tenenbaums, Wilson has become a household name. Read more about Owen here. There’s something dashing about Sebastian, a long name that once barely hugged the edges of the US Top 1000, but today is a solidly established choice for a son. It’s international, sophisticated, and widely recognized. There are Sebastians in Shakespeare and The Little Mermaid, from television shows from Glee to Reign. Nicknames like Seb and Bash make it slightly more approachable, but even in full, there’s no question that Sebastian counts as cool. Okay, this was the hardest list to compile! 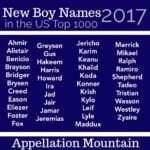 I’d love to hear yours: pick the ten coolest names from the current US Top 100! Name Help: We Can’t Name Him THAT! And while Theodore isn’t quite “cool,” I think Theo definitely is! James for sure! Also Luke, Wyatt, Levi, Eli and Ezra. I like Roman, Elias, Dominic, and Gavin. Yes! Exactly. Nothing says that a Top 100 name is somehow boring. I think the opposite is true – they’re SO appealing that we all want to use them. 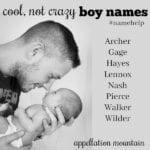 Is there a list of The “coolest” Girl Names?